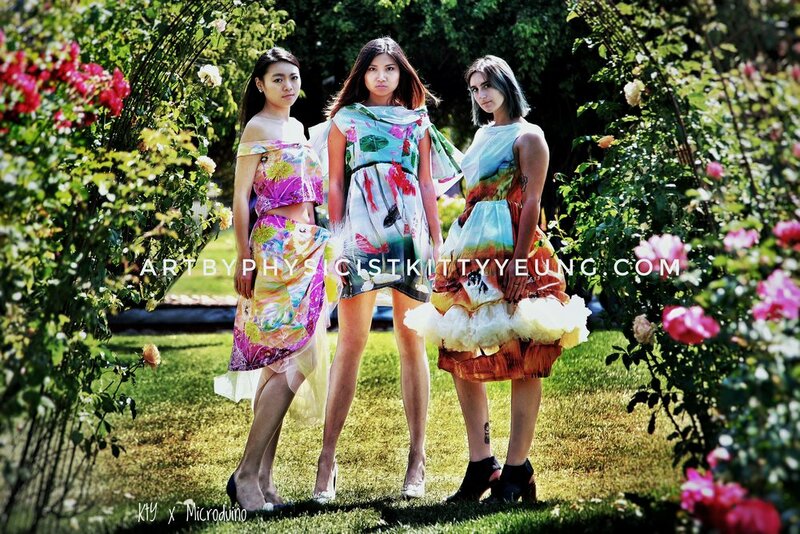 Kitty Yeung is a physicist, maker, fashion designer, artist and musician based in Silicon Valley, California. She recently started a new role as a senior program manager + creative technologist at the Garage, Microsoft. Previously, Kitty worked at Intel as a research scientist. She has a PhD in Applied Physics from Harvard University and M.Sci., M.A. and B.A. in Natural Sciences from the University of Cambridge. She enjoys integrating art/design with science/technology. Her fashion design focuses on applying cutting-edge technologies to garments and manufacturing processes. How did you get into fashion tech and wearable tech industry? I've always loved science and art since childhood and wanted to do both. I prioritized scientific training and majored in physics while pursuing art projects (painting and music) on the side. I design clothing for my graphic novel characters and decided to make them into reality by learning sewing in the last year of grad school. Quickly, I became a fashion designer while working as a research scientist and engineer. At first, my designs were more traditional. But since I like to tinker with electronics and learned to use maker platforms through a robotics project, I thought there was no reason not to combine fashion with electronics. That's how I started fashion design with technological features, embedding microcontrollers into garments (so they can be functional or decorative) and exploring new techniques in garment manufacturing processes. For me, wearable/fashion tech is the perfect industry to integrate science/technology with art/design. I just started a new role as a senior program manager and creative technologist at the Garage, Microsoft. This is an interesting program which provides a platform for making and hacking and help to bring employees' ideas to life, making the company an enjoyable workplace. In this role, I'll also be able to pursue my passion for consumer products and wearables. What helped me find this opportunity were my designs and creations and my work to bridge gaps in the industry ecosystem. When I was at Intel, it was lucky for me that the company had a focus on wearables and maker products some time ago, so I got to work on those full-time for a while and build a portfolio with many projects. I designed garments and accessories that embedded the Intel Curie module to demonstrate how to utilize the on-chip bluetooth, accelerometer, gyroscope and pattern matching engine. I really enjoy being both creative and technical and now my new role have provided me with an environment to expand further. For tech fashion, my last year's focus was on embedding electronics into clothing and using digital painting and digital printing to display my paintings on fabrics. This year, my design concept is more on applications of different technologies and techniques to fashion, such as embedding 3D-printed objects, solar panels, unusual materials, etc. I'm also exploring new and more efficient ways of manufacturing. I'm interested in producing unique and useful ready-to-wears to address people's needs. I want to demonstrate that the applications of technology are unlimited. Rather than producing a jacket or a dress that has certain features and pushing consumers to buy this one design, I'd like to show that these features could be applied in any garment. They should be a part of the manufacturing pipeline, and designers should be able to use them as another degree of freedom in design. Having my background in physics (BA, Masters and PhD) has helped me develop in industry. As Physics is the study of the fundamental properties of nature, it guides me to reach the bottom of problems and to find solutions by transferring my skills across disciplines. It also helps me see the beauty in the universe, which has been extensively demonstrated in my designs. However, in terms of finding a fitting career path, it's not been easy. As I mentioned, I've been trying to pursue my passion for both science/engineering and art/design, and to build a bridge in between. I haven't found established industries that provide much support for people who are both technical and creative. The current tech industry tends to employ people by putting them into confined boxes. It is often very hard for creative ideas to be implemented. Many people who have engineering, artistic and other interdisciplinary skills have a hard time finding employers who appreciate all their skill sets, and are not able to leverage them all. Many - a lot of them are women in wearables - either have to found startups themselves or innovate outside their day jobs. While jobs are usually either artistic or technical, but not both, I think that upcoming generations are going to be more well-rounded, especially given that we value STEAM education more and more. The current traditional industries are not ready for an interdisciplinary workforce. This has already manifested itself in the millennial generation; a lot of the younger workforce would rather move laterally, to experience the things they love, than climb the corporate ladder. 1. The development and production processes in the garment industry are backward and cumbersome. It has not been helped much by state-of-the-art technologies. Comparatively, the ways tech products are developed and produced are much more advanced and should be applied to garment development and production. 2. With the garment industry not being up-to-date with technology, it is difficult to produce products that integrate garments with high-tech elements. For example, there are not many factories that are able to produce and assemble both electronics and garments together. 3. We need more open manufacturing processes that lead designers to consumers more directly. Some new businesses, such as 3D printing or fabric digital printing companies, now can produce individual designs by letting designers simply upload digital files. Imagine the same principle being applied to garment design and production. There could be online services to digitize pattern designs, and to directly connect the designs to production machines. Such machines could also separately produce different parts of the garment, like sleeves, collar, bodice, etc. Consumers could select and order the combinations they preferred. Because every unit produced would be backed by an order, waste - currently severe in the garment industry - could be reduced. 4. Anyone can envision futuristic garment functionalities, but our current technologies may not yet be able to implement those functionalities. To make non-invasive, useful, comfortable and aesthetic wearable products, we need to invent smaller and flexible electronics that can be seamlessly embedded into textiles, new materials that are themselves functional, batteries or other methods of energy supply that have versatile form factors, long-distance wireless charging, computational capabilities in garments ... A lot of these still need significant research effort. 5. All the above reflects the lack of a complete ecosystem in wearable-tech production. Right now, when someone has a good idea for a useful product, a makerspace may be the go-to place to produce a prototype. But to be able to scale to large production volume, so a larger population can benefit from the idea, is much more difficult. Many different aspects have to work together: core technology <-> design/engineering <-> prototyping <-> manufacturing <-> business model <-> sales/marketing/public education <-> consumer needs, and of course funding for all these activities. Given all these challenges, there is a lot to be done. I'm happy to be continuing my childhood dreams, working in the field I love, contributing to society in my own way and pushing the boundaries step by step. 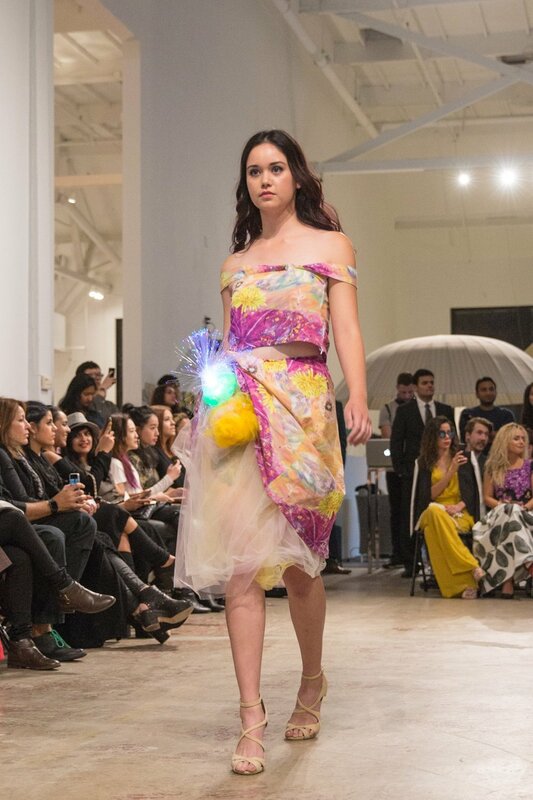 As a scientist, I'm fortunate to have recognition as a tech-designer in the fashion industry (I have been invited to fashion shows, including San Francisco Fashion Week 2016 to showcase 12 tech-embedded fashion pieces on the runway and recently received the Emerging Designer Award from the 2017 Guangdong, Hong Kong, Macau Fashion Festival) and an artist/engineer in the maker community. I'm most proud that a lot of my projects are open-source so that others can be inspired and learn how to build their own projects. What does the #WomenInTech movement mean to you? What are the challenges of being a woman in wearable tech and fashion tech? The word "wearables" was a hype a couple of years ago. Many people jumped on the bandwagon but left it for other buzzwords after finding the technical and marketing challenges. Only passionate people will keep working on these difficult challenges, while most tech companies have steered their attention to fields other than wearables. Most of these passionate people are women. And we need both career and industry support. In your opinion, what will be the key trends in the wearable tech and fashion tech industry in the next 5 years and where do you see it heading? Compared to a few years ago, the wearable/fashion tech industry is experiencing a quiet period. There are all these above-mentioned gaps to be filled. But gaps also mean opportunities. It is time for people who are driven by their love for wearables to lead the field. I think companies which are able to provide integrated tech-garment manufacturing or platforms for designer-to-consumer services will go a long way. Who are your 3 inspirational women in wearable tech and fashion tech? Only 3? Lady Ada, Anouk Wipprecht, Asta Roseway and many more.